The Shri Shiva Nataraja temple in Tillai-Chidambaram is a treasure trove of myth, tradition and ancient sciences. It has an extensive mythology and doctrine. The Chidambara Mahatmya, its sthala purana, tells us about the two sages that were part of the story of its inception. Known as Vyaghrapada or Tiger Foot, and Patanajali, Fallen from Folded Hands, they play a crucial role in the temple’s history. The true origin of the Nataraja temple lies of course with Shiva and his performance of the Ananda Tandava in what was in those days known as Tillai. Today it is known as Chidambaram, the Space of Consciousness. This goes back to Shiva’s original performance of his Cosmic Dance in the Daruvana. This dance was to open the eyes of the rishis living there. Both Vyaghrapada and Patanjali were inspired in different ways to long to see Shiva’s Cosmic Dance. They devoted themselves and eventually arrived through different paths in Tillai where they awaited Shiva’s arrival. Vyaghrapada was the first to arrive in Tillai-Chidambaram. He was the son of the Muni Madhyandina. When his father asked him his greatest wish, his son asked him to tell him which tapas would free him from the effects of cause and effect and from rebirth and would give him complete happiness. Madhyandina instructs his son to go the Tillai forest as this is the only place among all the worlds that has the stability/strength to be the stage for Shiva’s Cosmic Dance. Madhyandinas son travels across all of India to find the Tillai forest. This is a forest of mangrove trees, and must have been near the coast in those days. Once he arrived there he found a sacred lake full lotuses called Shivaganga. And a self-existing Linga on its southern bank at the place called Mulasthana, the Place of the Root. Madhyandina’s son settles in the forest and builds himself a hut nearby. He spends his days worshipping this Linga as Shiva’s abstract form. After sincerely practicing his tapas for a while he became desperate that he was never early enough to gather flowers that had not been touched by bees or insects. After crying for help Shiva appeared to him and gave him the tiger feet and hands. With eyes in his hands and feet also in order to see clearly and find his way in the dark. Vyaghrapada is depicted as a human being with tiger’s legs and hands. In his hands and feet eyes are shown. Patanjali was the incarnation of Adi Shesha, Vishnu’s resting place or vehicle. Vishnu’s recounting of seeing and experiencing Shiva’s Ananda Tandava in the Daruvana forest Adi Shesha begged his Lord’s permission to go and see the Cosmic dance for himself. After performing strenuous tapas Shiva gave him the boon of being born a son to the sage Atri and his wife Anasuya . She dropped him from shock as he appeared in his half snake form in her hands. From there came his name Pata-anjali, Patanjali, Fallen from Folded Hands. As Adhishesha was the King of Snakes Patanjali proceeded towards Tillai-Chidambaram through Patala, the Underworld. This is the world of the nagas or cobras. As he reached the sacred forest of Tillai-Chidambaram he was met by Vyaghrapada. 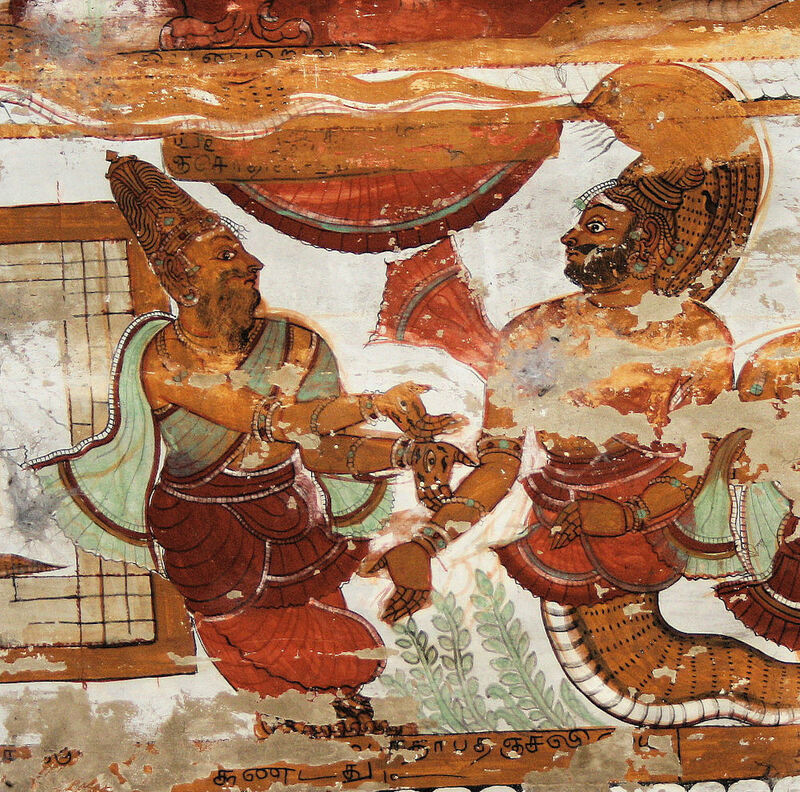 Vyaghrapada, the Tiger Footed saint, shows Patanjali around. Lets him take his bath in the Shivaganga pond and directs Patanjali to offer his worship at the Mulasthana Linga. Patanjali also builds himself a small hut and erects a Linga to for his personal worship on the East bank of the lotus pond. Patanjali has the lower body of a cobra and sometimes also a five-headed cobra as a hood behind his torso. Together Vyaghrapada and Patanjali await the day Shiva will arrive to perform his Cosmic Dance, the Ananda Tandava, Dance of Bliss in Tillai-Chidambaram. While waiting they are joined by 3000 Munis. Although they had to wait long, they never slackened in their devotion. Eventually their patience is rewarded. On the appointed day, in the Tamil month of Tai, on midday, on a Thursday, with the full moon in the lunar mansion Pushan, Shiva arrives in full glory and performs his Ananda Tandava in the Chit Sabha. very well written with great information. keep going Liesbeth! Informative and need a help from regarding Chidambara Mahatmya.. Do you have any soft copy of the book. please do let me know. very informative. i have been singing songs of these saints without knowing who they were and the storyconnected with the. i dont think many people know these stories. please keep going on this.